Tired of dentures that slip or move around constantly? Unable to wear a denture because it gags you? Struggling with endless tooth decay or periodontal disease that is not under control? The All on Four technique may be the solution you have been looking for. In as a little as a day, a U shaped denture that stays in all the time can be made to replace your current teeth or dentures. Am I a candidate for the All on Four Technique? You may very well be a candidate for the All on Four Technique if you are missing all, or most, of your upper or lower teeth or if you suffer from constant decay or periodontal disease that is not under control. In order to determine if you are a candidate we will take a Cone Beam CT scan at your initial appointment to determine whether you have a sufficient amount of jawbone to support implants. Please contact our office so we can set up a time to meet with you to see if you are a candidate for this state-of- the-art solution to poor function and a compromised quality of life. What should I expect if I undergo the All on Four procedure? 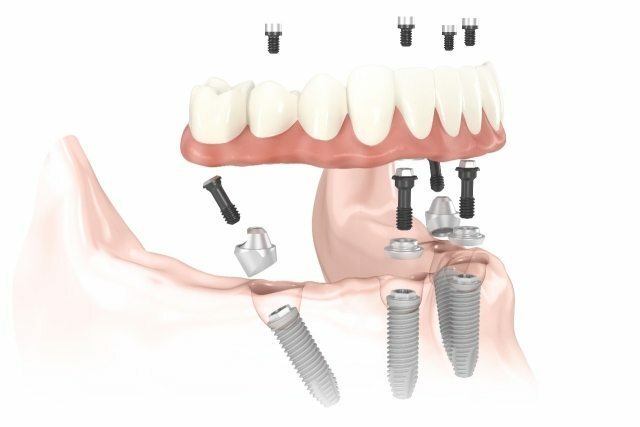 Getting implant supported dentures is a multi-step process. Before treatment can begin, steps will be taken to create an immediate denture prosthesis. Once treatment begins, implants will be secured within their designated locations inside the jaw. 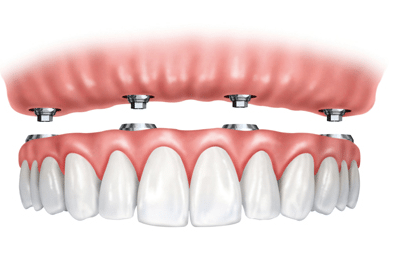 In our office, it is often possible to secure a denture prosthesis to the implants at the time of implant placement. The amount of time that dental implants need to heal varies but we will be with you every step of the way to make your transition as smooth as possible. At the conclusion of implant healing, you’ll return to your dentist’s office to construct the final prosthesis. We continue to monitor and care for all our implant patients even after their treatment has been completed. You will be seen semi-annually to help you clean and maintain your prosthesis. We will discuss with you in greater detail at your initial appointment.